Re: HIghways England LED press release. When you think of some of those far fetched headlines which graced some of the less cerebral newspapers of the 80s, false or fake news is not a new phenomenon. You may remember the report of the London bus "discovered" on the surface of the moon or how a certain comedian of the time was reputed to have consumed a whole hamster. Even supposedly serious news cannot be taken at face value. Sometimes it is deliberate whilst other occasions a genuine error can be the cause. Of course it is in everybody's interest to have news which is true and correct - or is it? In some respects Sotonsteve is correct in his understanding of what seems to be quite a "lightweight" article. Assuming it is aimed at the small proportion of the motoring public who are concerned enough to read it, it's purpose would be to let them know the reason why there may have been road closures or late night operations. The result of all the disruption is shiny, new lighting, however in order to "sell" what must be a considerable investment of public funds, it is necessary to extol its virtues. Getting the balance right is tricky. If it is too technical you will alienate your readership, whilst if the subject is too vague or dumbed down, others could wrongly believe the real truth is being hidden. As HE is responsible for strategic routes nationally, I would suspect this is a standard press release, which is adjusted to suit local conditions. It is very unlikely that decisions on the selection and purchasing of lanterns would be taken at such a local level. In one respect, the article is valid in its use of the phrase "national first" in the innovative use of LED technology on the M62 J22-25 and M621. It has to be, for presumably the earlier lighting was either SOX or SON. I agree with Sotonsteve that it is not the first use of LED in the country, but for this section of the motorway, it certainly is. In some ways, it is not a case of news being fake, but how it is interpreted. On a less serious note, I always like reading these sort of articles, especially where the potential savings are added up. I like the bit where the article quoted a saving of 700 tonnes of carbon, enough for powering homes of 20,000 people and 389,000 loads of washing! "As we moved along in a little procession, I was delighted with the illumination of the streets. So many lamps and they burned until morning, my father said, and so people did not need to carry lanterns." Mary Antin - US author & activist. 1881-1949. The line of MA60s from M1 J5 to J6 has been interrupted by a new column with Iridiums, alarmingly close to the catenary stretch. Photos taken from Bucknalls Lane northbound might have a SON-tinge to them, though thankfully it is behind the bridge. Unfortunate as the rest of the SOX is still well maintained. The fact that they bothered to install this casual replacement suggests the rest of the legacy equipment, as long as it works, might survive a little longer. The M40 indeed has new columns with LED lanterns through and west of the M25, they looked to be Lumas from where I was viewing them. The M1 Catthorpe interchange at J19 now has black Amperas on brand new folded metal section columns (and unusually for new installations, on the central reservation) to the south of the M6 merge. At the merge, there are Evolos on similar columns. North of the interchange, some of the legacy lighting with ZX3s still survives. Not very good due to looking into the sun, dash cam pic. Noticed today that on the M1 between J6A and 9, all the Sapphires have been replaced by LED lanterns. Not sure what type, or when it was done, but nice to see 600W SON being replaced. The catenary lighting to the South of J6A lives on into 2018! Also, some of the Iridiums at J11 have been replaced by what looks like Amperas. Thank goodness for that. It must have happened in the last month as they were still there at the end of 2017. The suspended lighting lives on as it is managed by Connect Plus rather than Amey, the former of which are quite stingy. I wonder if it could be a candidate for grade listing. On the other hand, the SOX on the J7 overpass and Park Street Roundabout may well be gone by now. The SOX at the J7 overpass was still there on Thursday, and dayburning, but it can’t have much longer left. Can’t speak for Park Street though. 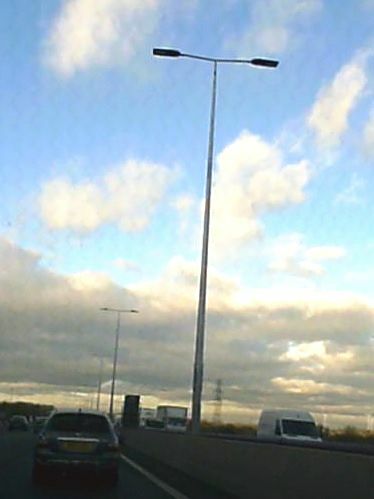 The M8 at J28/29 by Glasgow airport has columns with unusual stub brackets supporting Lumas on one side together with post top mounted Irdiums. Historic GSV, showed the Lumas replaced ZX3s, but the brackets were unchanged when the Lumas were fitted. The SOX over M1 J7 (currently dayburning) and on the approach to Park Street are somehow hanging on, as are some Iridiums north of J10. According to an article by Lux, Highways England has reported issues of lanterns falling off columns. This issue has been noted to affect Philips Iridium2, Philips Luma and Urbis Ampera. I've already noted incidents of Lumas shearing from their spigots on the M27 and M275 in Portsmouth, and in the midlands I have seen lots of Iridium2s with their canopies up or missing.